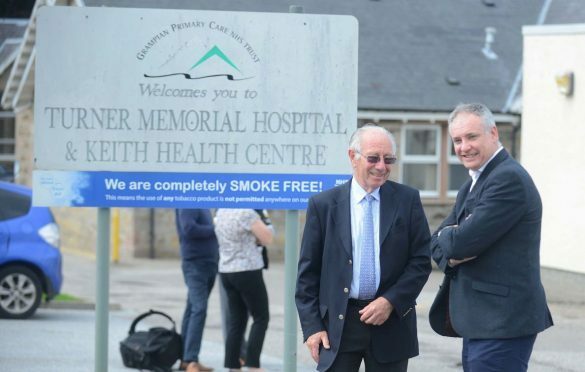 Leon Stelmach, chairman of Keith Health Centre's patient participation group, and Moray MSP Richard Lochhead want new facilities in the town. A project manager has been appointed to move forward plans for a Keith’s new medical centre. Susan Pellegrom will be tasked with developing a blueprint for what should be included in the new facility. Patients in the town have previously expressed their concerns about the condition of the current local GP practice and Turner Memorial Hospital. Parts of the aging complex are now not suitable for people in wheelchairs, while some rooms are not able to house modern equipment. Campaigners have long pressed for a new facility to be built in Keith and a site has been identified near the town’s secondary school for it to be constructed on. Leon Stelmach, chairman of the practice’s patient participation group, which represents the centre’s 7,000 patients, hailed the appointment of Mrs Pellegrom as a “huge milestone” for them. He said: “The current Keith premises are well past its sell-by date and this is very good news for everyone. “Now all we need is for the local people to speak up and come forward to tell her what they want to see done. NHS Grampian allocated money to employ a project manager at the end of last year. Mrs Pellegrom comes with a wealth of experience, as she is a former practice manager at the current Keith Health Centre. He said: “The patient participation group have worked tirelessly on their campaign and I’ve supported their efforts by having discussions with the relevant public agencies, including the health secretary’s visit to the health centre, to make the case for a new health centre.